Let’s face it, we all build friendships through the networking that we do. Through conferences and networking I have personally formed some amazing friendships. However, something we need to remember as students is keeping personal things personal and professional things professional. Please stick with me through the story I am about to tell. I promise I have a point. That's me on the podium! An example that I have of this comes from when I was a junior in high school (which seems like forever ago!). Let me start by saying that I was a huge band nerd and marching band was my main priority, after wind ensemble of course. My freshman year in high school was the first year I was in marching band, and because of the student leaders I had my passion grew tremendously for this activity. While I have been playing music since I was three, marching band in high school made my passion for music even stronger. Of course I wanted to be the drum major, mainly because the drum major my freshman year was amazing and shared the same passion that I did for music. I wanted to be just like her. Well, my junior year I received the honor of being the head drum major of my high school marching band. All of the hard work had finally paid off and I was ecstatic for the next season to start. Over the summer between my sophomore and junior year I, along with the assistant drum major, attended a camp focused on leadership within the marching band. 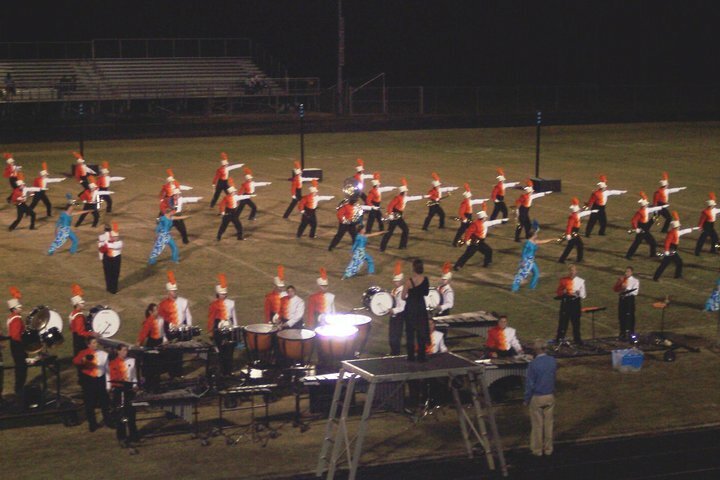 We also met with our band director several times to get everything in place for the 2006 season. During one of the meetings my band director told us we needed to remember that if anything personal happened between us and a friend we had to keep it off of the field. When we set foot on the marching field it was time to work. You are not supposed to favor a friend and definitely not supposed to bring your personal problems onto the field. You are on the field to make music and represent it through marching. I do not know how much you guys know about marching band, and I do not want this post to last forever, but being in this leadership position in high school taught me many things for my future. While yes, we are all human and there may be times where we forget to keep personal things at home, we must remember that when we are at work it is time to work. While it is great to build friendships with the people you work with, you also need to find a balance between your working relationship and friendship. If you have a conflict, do not let it show in your work. Sit down outside of work and discuss it. Yes, things will happen, but be prepared to work through them. Running the student-run firm on campus has reminded me of my marching band days. I have built some great friendships through CatCom, but I have to remember that as a student-run firm, and as the leader of the firm, we have work to do, so it is important to have a boundary set of a working relationship and a friendship outside of work. What are your thoughts on working relationships and co-worker friendships? Do you think it is okay to have that friendship? Why or why not? Hey ashley, I think there is a point in your story. But I think the key is respect. I have been friends with many people I worked with some of them worked under me. We never had any problems what so ever. Even the moments we had a discussion in the personal time we never brought it to work. But that doesn’t mean you can’t be friends during professional hours. I think the best result are given if you work with a real team and to get that you have to build that, part of the team building is get to know each other as an individual. My experience is that it is possible as long as everybody knows when it’s time to work and when it’s time to play!! I think friendships at work are great. Like it or not we will spend the large majority of our adult lives either at work or thinking about it. I agree with what you said about keeping it professional at work though. Inside jokes are fine and so is spontaneous socializing, you just have to know what needs to be done and make sure it is getting done well. Some of the best friendships I have are with people that I have worked with. With being a color guard section leader last year, and now being promoted to color guard coordinator I understand completely where you are coming from. The first thing I told my new captains this year was “Remember your image starts now.” You are an example on and off the field. I don’t agree with partying in mix company, especially when you are a captain drinking with the people you are suppose to be a leader for. With my color guard they know that I can be fun, and can have a good time joking with them, but they know when I am serious that they need to watch out and do what they are told. It’s just a level of respect and if they see you acting a fool then that’s how they are going to act. So don’t cry about it when you can’t control it. Also with being a leader you are NOT allowed to bring your emotions in to the mix. You are responsible for caring for everyone elses emotions and making them feel better because you are the person that they look to. I have a lot of opinions about this topic… I could just keep rambling. But I got where I am today with the POTM band because everyone said I was a respectable leader and would take this color guard and run with it. After what little experience I have in the work place (only a year and a half), I have to say that I don’t think friendships at work are a bad thing. I have plenty of co-workers that I consider friends (some in management roles), and I believe that’s because of how much time we spend together. If you really think about it, you spend more time at work during the week than at home! Obviously, it depends on the office and the people, but I am very lucky to have wonderful co-workers that I can call friends as well. You just have to feel it out and see how the dynamic is! Thanks for the response Christa! Glad to hear I am not the only band nerd out there. 😉 I was huge into concert band as well, but marching season was my favorite! Thanks Ben! I agree, work friendships are great! You just have to make sure you are getting things done that need to be done. I have formed great friendships with people I work with and I would not have that any other way. Thanks for your response! Respect is everything. You are right. I have had numerous part-time jobs in high school and some of my best friends are people that I worked with. While we were at work (Quizno’s) we knew we had time to have conversations when we were slow, but we also knew that we had things that had to be completed by specific times. You’re right. You definitely need to get to know the people you work with so that you can work well together!